These apps are digitally signed, require no "permissions" and will not bombard you with ads. They are free to download and free to use. The apps are designed to work with Android Version 2.2 or later. The v1.2 apps will optionally work in portrait or auto modes. They also optionally do not begin playing until Play is pressed. 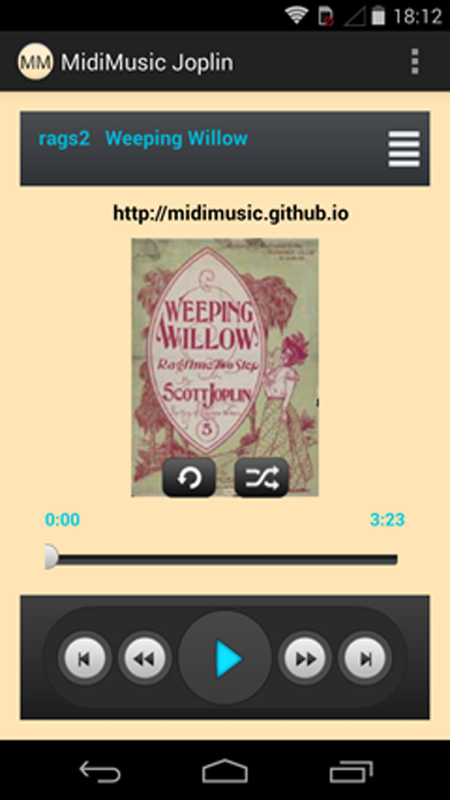 The MidiMusic Joplin App will play all of Scott Joplin's piano music. All the music is contained within the app and will play without an Internet connection. MidiMusicJoplin.apk Securely download v1.2 here. 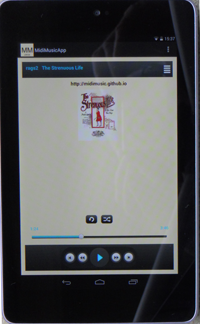 The pictures show the Scott Joplin app playing on a Nexus 7 tablet and a screenshot playing on a Moto G phone. The MidiMusic Wurlitzer Band Organ App will play all of the Wurlitzer Band Organ Music on this site. All the music is contained within the app and will play without an Internet connection. MidiMusicWurlitzer.apk Securely download v1.2 here. The MidiMusic Wurlitzer Caliola App will play all of the Wurlitzer Caliola Music on this site. All the music is contained within the app and will play without an Internet connection. MidiMusicCaliola.apk Securely download v1.2 here.